So what exactly have they been bombing? 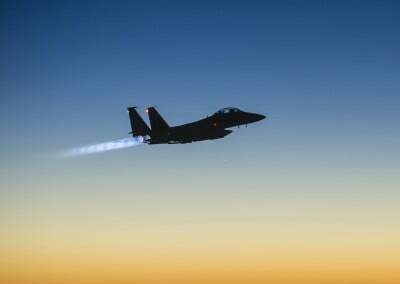 The terrorists’ oil field in eastern Syria – part of a half a billion dollar crude industry for the group – was obliterated in a day of bombing conducted by both Russia and the US-led coalition. US operations officer Major Michael Filanowski told reporters in Baghdad the Omar oil field was blitzed, heavily damaging the lucrative funding source for ISIS. He said: “There were strikes last night that struck Daesh-controlled oil refineries, command and control centres and transportation nodes. Four Tornados took off from RAF Akrotiri, Cyprus just an hour after MPs voted in favour of launching airstrikes in the war-torn country. The jets struck targets in the Omar oil field in Eastern Syria, dealing a “real blow” to the death cult, also known as Daesh. One wonders… how it might be possible to deal a ‘real blow’ to a target which had already been ‘obliterated’ over one month ago? Of course, it is possible that excessive hyperbole was used in the original reporting, but it is interesting that this was the first target that the British report hitting. Just over two weeks ago, British Foreign Secretary Philip Hammond was insisting that the internationally recognised and legal government headed by President of Syria Bashar al-Assad“has to go“, but that “We [the UK] are not seeking to destroy the institutions of government in Syria” – surely this is one of the greatest examples of double speak we’ve seen yet. If Britain’s airstrikes are not hitting actual live ISIS targets, perhaps they are already working on their true end game of trying to oust Assad. To do so, they will have to avoid hitting terrorist fighters because they will need to work with them in order to achieve their primary objective which is regime change. Still, they will have to deal with the increasing Russia presence seeking to secure the sovereignty of Syria. As 21WIRE first reported last year, on the first day of the US-led Coalition ‘Anti-ISIL Airstrikes’ last fall in 2014, the US hit a series of empty targets, where ISIS fighter were actually given advanced warning and vacated the building in advance of bombing raids. It should come as no surprise if Cameron is actually dropping bombs on already ‘obliterated’ targets. Those weapons have to be paid for, which will make the British government’s friends inthe military industrial complex incredibly happy indeed.